In the evening of December 19, 2017, Crown Princess Mette-Marit of Norway attended the Oslo municipality's annual Christmas dinner at City Hall (Rådhushallen) in Oslo. What is she supposed to use? Fashion is fashion. I wear also almost every day black tights at winter time. That is just what we do here in north. I personally do not understand at all this continuous nagging about her tights. Light stockings look mostly just ridiculous when it is very dark and no light outside. Mind you this time of year we have no real day at all, just dusk and dark. I live in Australia, so I can only imagine how cold it must be. Our winters are mild in comparison, but even I wear dark tights in winter. Cold is not so big problem, it is matter of what to wear and our buildings are very well build and warm (our house inside evenly 21 - 22 C, geothermal heating) but this darkness, that is terrible. This year is actually not so bad when we have already snow even in south country, but still almost no day at all. Yesterday was the darkest day of the year, now days get longer every day. In very north there is about 1 m snow and have been weeks - 25 C, no day at all for 2 months (sun does not rise at all!). Masha: also reverse is rather interesting, at summertime there in north part sun does not get down at all for the same two moths. Here where I live, day is as longest 22.6. about 20 h + dusk 3 h per day at summer, what leaves 1 h night. I've got over the black tights issue (I wear them all the time in winter too - well, maybe not with red). She looks good. 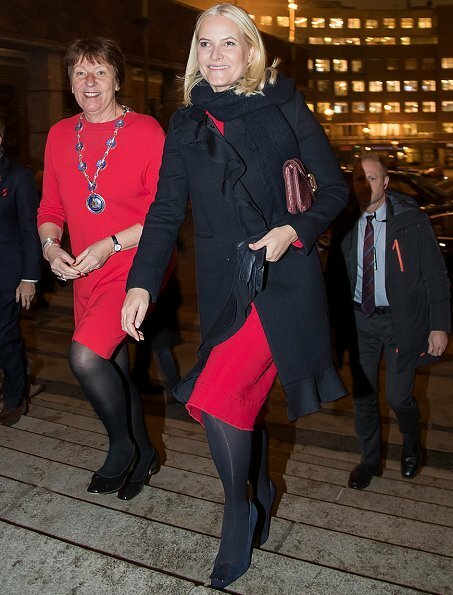 Mette-Marit looks lovely in black over red. The lady with the chain and badge (is she the Mayor or a city Councillor?) looks also very nice and looks in full festive mood.